This post is sponsored by Chickapea Pasta | Opinions are my own. Thanks for supporting the brands that I love and trust. The idea behind quick n’ easy weeknight dinners seems to be targeted towards families; bustling parents with restless spawns. But let me tell you, they’re great for self-employed people who work from home too—like yours truly, right here. (Hi.) Because after a full day of content planning, photo styling, and post-production, I don’t have the time or energy to stuff chicken breasts, sauté veggies, and mash potatoes either. By the time 6pm rolls around and I finally decide to slam my laptop shut, I’m one glass of wine into my evening and ready to mow down on whatever is fast and simple. Extra points if it’s nutritious. Now, I’m the first person to bring a cozy bowl of warming pasta to the couch after a long day. But sometimes the thought of filling up on empty calories really bums me out, man. Right now, at the ripe age of 35, I’m thrilled to say that I’m healthier than I ever was in my 20s. But this also means that I think about everything I put into my body and, at times, that means passing on some of my faves—like pasta! Except not anymore. BECAUSE CHICKAPEA. Chickapea pasta will fill you up and make you feel good. If you’ve ever made pasta from scratch, you know what goes into it: flour, eggs, and salt. And it creates a beautiful thing! Albeit not a very nutritious thing, which is why I’m currently obsessed with Chickapea’s superfood pasta. Made up of only two ingredients—organic chickpeas and red lentils—Chickapea’s pasta is super rich in protein with 27 grams per serving. (Did you rub your eyes? You read that correctly; 27 grams of protein per serving.) On top of that, you get a whopping 13 grams of fiber per serving, 35% of your daily iron intake, and a ton of potassium, vitamin C, and B-vitamins, which are beneficial to supporting heart health. No artificial ingredients and no added sugar. As far as dietary restrictions and allergies go, Chickapea is still a fab choice. It’s vegan, gluten free, organic, kosher, and non-GMO! Creamy Instant Pot Pasta With Romesco Sauce. I tested this recipe four times before cracking the code of timing and the liquid-to-pasta ratio. Once I nailed it, I felt like a sorcerer. A lot of people refer to the Instant Pot as “magical”, but I’m a believer that you, the user, need to be the magician behind the gadget. But I’m really glad this recipe worked out, because who doesn’t want to dive into an effortless pasta dish after a busy day? If you’ve ever had Romesco, it was probably slathered over a fillet of fish. This almond and red pepper-based sauce originated in Spain and was intended to be eaten with fish. BUT! This good stuff is way too darn tasty to not experiment with it, so I add it anywhere that I think it makes sense. And with nutty, hearty Chickapea pasta, it made sense. 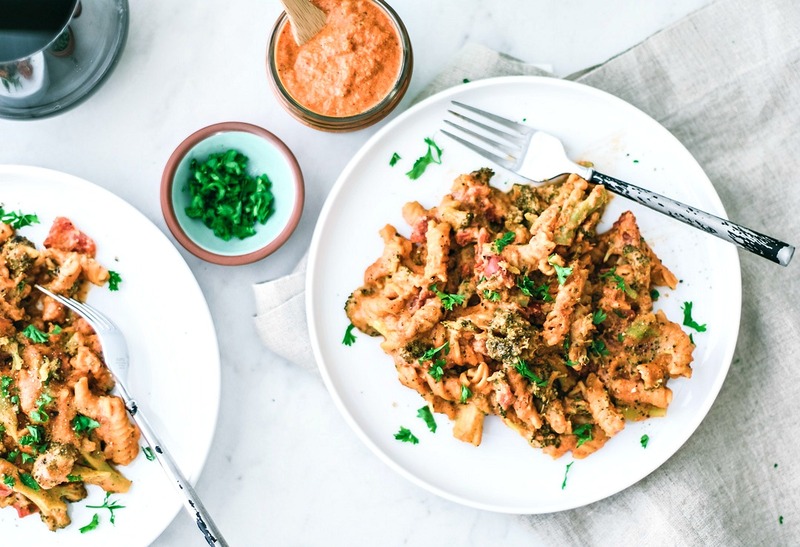 This Creamy Instant Pot Pasta With Romesco Sauce is the perfect weeknight dinner. It's vegan, dairy free, and gluten free, so everyone can enjoy! 2 TBSP nutritional yeast If you don't have nutritional yeast and aren't vegan or vegetarian, you can substitute with grated parmesan or romano cheese. Romesco Sauce (Yields about 2 cups). Place all of the ingredients into a blender or food processor and blend until smooth. For a chunkier consistency, pulse the mixture until you reach your desired texture. Transfer the sauce to a sealable container and set aside. If you're making it in advance, refrigerate it until you use it. When sealed and refrigerated, the sauce keeps for 5-7 days. Dump your Chickapea pasta into an Instant Pot. Add the milk, water, 1 cup of fire roasted tomatoes, and 1 cup of the Romesco sauce. Stir well to combine and ensure that all of the pasta is covered with liquid. Add the broccoli to the top of the pasta; don't mix it in. Secure and lock the lid of the Instant Pot. Press the "Pressure Cook” or “Manual” button and set the time for 1 minute on High pressure; if you like a softer pasta that isn't al dente, cook it for 2 minutes on High pressure. When the pasta is done cooking, hit the quick release button to release the pressure. Once you've released all of the pressure, remove the lid with caution—there will be a lot of steam. Stir the pasta in the Instant Pot to mix everything up. Taste, and season with salt and pepper to your taste. Garnish with fresh parsley or basil and serve. That looks uh-mazing!!! Roasted red peppers are my favorite in pasta sauces. Love how quick and simple it is but so fresh and fun!!! Yes! I was so happy, too. I'm thinking any pasta will work in the Instant Pot—it's all in the formula of the timing. I bought an instant pot months ago and have only used it once, haha. This looks like the perfect way to get me excited about it! I love the sauce and your photos are beautiful! I love using my Instant Pot to make healthy meals on busy nights and this fits the bill perfectly! Romesco sauce is one of my favorites too! Isn't romesco fabulous? I love it on fish, but damn, it's great on pasta too. What a delicious pasta! We eat Chickapea all the time and this sauce is so perfect with it. Thank you for the great recipe!! This is brilliant Dana and these photos are beyond stunning! Gorgeous, as usual, Dana! I still don't have an instant pot, but this sure makes me want one haha! Doooo ittt! I have a feeling you'd love it, Trish. Love Chickapea pasta, love the sauce, and love everything about this dish! Looks perfect. That is such a beautiful sauce!! Perfect to pair with Chickapea! This recipe looks and sounds incredible. Can't wait to try it. I AM 10000% MAKING THIS- BUT WITHOUT THE NUTS! I AM IN LOVEEEEE!! I guess I'll let the lack of nuts slide JUST FOR YOU. Haha. I hope it's just as good without them, GiGi! Keep me posted! Stunning! This looks amazing! I just love how healthy and easy this is. Definitely something I am going to try with my family! Thank you!? This beautiful dish looks so warning and hearty! I love how simple and flavorful it is! YUM! I definitely think meat dishes are easier in the Instant pot that trying to perfectly time things like pasta or veggies! But it looks like you figured it out -- I can't believe I can have THIS for dinner in 1 minute! :) Looks incredible -- love how much nutrition Chickapea brings to the table! Yes! I honestly thought I'd mostly be doing meaty dishes in my IP, but I'm over the moon with how many things you can actually do in this machine. It's a lot of trial and error, but in the end, it's worth it. Loving this super quick and tasty recipe, Dana! So much flavor and super nutritious too! I wanna dive right into that plate! That sauce sounds incredible and I bet it tastes even better with Chickapea!